I arrived at Cairo airport in the middle of a dust storm. It was hot and windy and I felt dirty from the moment I stepped outside. Cairo is a huge mass of buildings, mostly half finished or half in ruins, crammed together with no sense of order. The traffic was as much a mess as the buildings, with up to eight lanes of traffic with no lane markings or traffic lights. People just veer across lanes when they need to turn. I didn’t see a single car without a dent in it! The first day in Cairo we went straight to the Pyramids of Giza. It was a really weird feeling to be standing in front of something that has been standing for 3000 years. I could never quite get my head around how old things were. I live in a country where we get excited about a building more than 100 years old! We rode camels out to the latest excavation site, where the tombs of many men believed to have been the builders of the pyramids, have been discovered. We gazed in awe at the Sphinx. We went out to Saqqara to see the first building in the world built more than one story high – the step pyramid. It’s still standing! The overnight train to Aswan follows the Nile upstream for the whole journey, so the scenery was unchanging – irrigated fields to the right, with palm trees giving it a lush, tropical feel, but to the left only arid desert and mountains. Aswan is the original market town, so flanked by two guys from my tour I ventured into the markets. I was still hassled by every Egyptian male that we passed, and every person we passed was an Egyptian male. The lack of females walking the streets is a little disconcerting. “G’day mate!”, they call out in their well practised Australian accents. How can they tell I’m Australian? 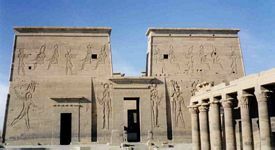 The Philae Temple, upstream of the High Dam made a huge impression on me. It is a beautiful setting – standing on one of several islands made of large round boulders, dotted through with palm trees and surrounded by crystal blue water. The temple had to be relocated to this island to save it from the rising dammed water. It was cut into blocks and reassembled barely 500m from its original site. There are water marks on the front of the temple. Structurally, it is so much more intricate than a simple pyramid. Every surface is engraved with pictures and hieroglyphics. Unlike at Giza, there is a very strong sense of an ancient civilization here. 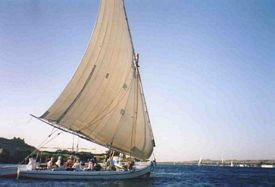 We reached Luxor by sailing for two nights down the Nile on a felucca. Unfortunately, by this time most of the group was sick, including me, so much of this experience is a blur between napping in the sun, stomach cramps and falling asleep under the stars to the sound of our Nubian captains beating their drums. After dark we visited Luxor Temple. At the back of the temple where the high altar used to stand the walls have been covered over with frescoes by the Roman Catholics. The frescoes have peeled off over time to reveal the still intact hieroglyphics beneath them. It somehow seems fitting that they should have survived longer. We were a little slow leaving the temple and had to be escorted out by armed guards who demanded money for the privilege. Everyone demands a tip in Egypt and it is particularly hard to say no to a man carrying a machine gun! I never got used to the guns. Some of our travelling was done under armed guard in government convoys for our own protection after the terrorist attack several years ago. I have to say that having a man with a machine gun sitting on our bus didn’t make me feel any safer. Our biggest sightseeing day included the Valley of the Kings, the Valley of the Queens, Hatshepsut temple (affectionately known by the group as “Hot Chicken Soup”, much easier to pronounce), Habou temple and finally Karnak temple. By Karnak we were all a bit templed out and found the sight of a bat falling out of the sky somewhat more interesting. Our guide delighted us with stories of aliens building the pyramids when passers by tried to eavesdrop on his talks. It was an amusing end to the tourist section of the trip. After an horrendous 17 hour bus trip we arrived in Dahab – a seaside town with restaurants all along the beach. This place is so calm, even the street vendors seem to find it an effort to call out to you. A bumpy jeep ride up the coast took us to the Blue Hole, some of the best diving in the world. 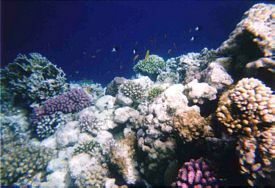 When we’d had our fill of coral and every fish imaginable there were mats and cushions to recline upon in the shade. The view out over the Red Sea to the mountains of Saudi Arabia and down the arid coastline seems at odds with the wealth of life below the waves. We hiked up Mt Sinai, the mountain where Moses is said to have received the ten commandments, in the cool breezes of night under a starlit sky to reach the summit for sunrise, which was viewed from the warmth of our sleeping bags. Barely hours later the cold of the night was forgotten as we hiked down under the ferocious heat of the early morning sun. Returning to Cairo we visited the Coptic area where there is a church that Mary, Joseph and baby Jesus sheltered in for three months when King Herod ordered the death of all baby boys. Next door is a synagogue in which there is an inscription in Hebrew that says ‘Jehovah’, but upside down it reads ‘Allah’ in Arabic. For the first time I realised how intertwined all religions are. The last evening in Egypt we went to the sound and light show at Giza. It was nice to begin and end with the pyramids and I felt as though I’d come full circle. This time I looked at the pyramids with a knowledge of the people that built them that you can only gain by walking through their temples, sailing down the Nile and studying the writings on the walls of their tombs.